In this Holy month of Ramadan, on one side shaitan is imprisoned and on other side the shower of blessings from ALLAH continuously fall upon us. In fact in our usual life we have to fight against shaitan by offering two rak�at prayers but in holy days of Ramadan, little struggle is enough to stand whole night in the prayers. So why do we not keep ourselves ready to accumulate blessings of this Holy month of Ramadan. Today we are going to start the preparation for an achievement which must be the wish of every Muslim and why not, is this possible that some one to whom you love and you don�t want to see him. Just think about the state of that person, who lost his father in his early childhood and unluckily his relatives did not have any picture of him, and he wants to see his father. But after a long period of time he has known a person who has father�s picture. So don�t you think that he will try to see till the end of last hope? Now imagine that personality who loves us more than our parents, whose love is justified by Holy Quran itself and he is important to every Muslim than his parents, colleagues and his life, so how it is possible that a Muslim doesn�t wish to see him. 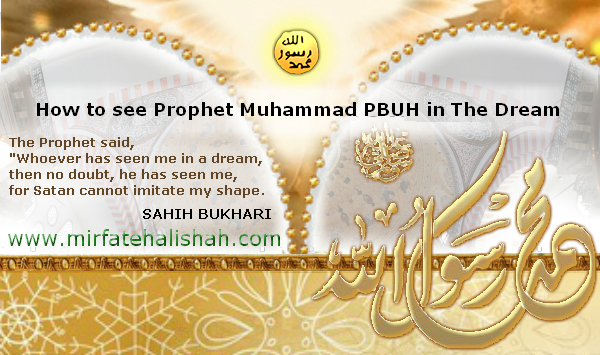 ALLAH will make you to see Holy Prophet S.A.W Amen and don�t forget us in your prayers. Note: Please be advised that above mentioned way is the one way to achieve your goal. You may choose other ways to get vision of Holy Prophet S.A.W instructed by religious scholars.